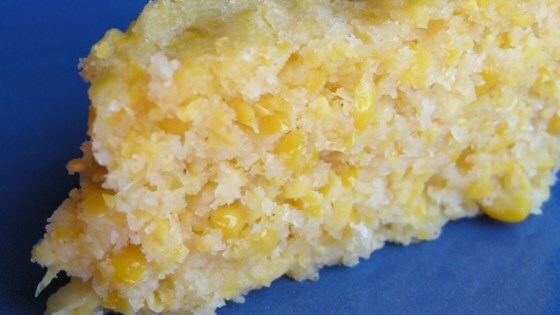 "A Mexican sweet corn cake with a spoon bread consistency." In a medium bowl beat butter until it is creamy. Add the Mexican corn flour and water and beat until well mixed. Using a food processor, process thawed corn, but leave chunky. Stir into the butter mixture. In a separate bowl, mix cornmeal, sugar, cream, salt, and baking powder. Add to corn flour mixture and stir to combine. Pour batter into an ungreased 8x8 inch baking pan. Smooth batter and cover with aluminum foil. Place pan into a 9x13 inch baking dish that is filled a third of the way with water. Bake in a preheated 350 degree oven F (175 degrees C) oven for 50 to 60 minutes. Allow to cool for 10 minutes. Use an ice cream scoop for easy removal from pan. See how to make Mexican sweet corn pudding-cake. Not to my liking. Too sweet and too much fat. Loved it! I used cream corn and Canned corn and left out the cream. Delicious!! Got alot of raves--"just like our favorite mexican chain"--Flavor was great, but it had a little too much corn for my taste--will reduce next time. My whole family loved this dish. I used milk instead of heavy cream. We will have this again soon. This tastes exactly like the sweet corn tomalito they serve as a side at Chevy's! I used canned corn instead of frozen... this is SO good!